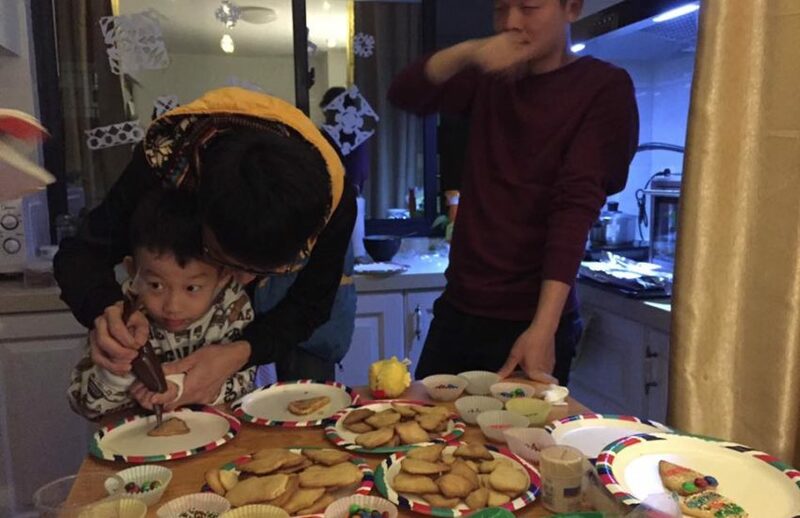 Chinese Christmas Cookie Decorating Party | WWAM Bam! My hometown is in the snowy hills of New England where people tap their own maple trees and bake their own bread instead of buying it. Christmas is a favorite holiday and everyone bakes cookies and donuts, hand knits gifts, and goes door-to-door singing Christmas carols. It’s very quaint and traditional. But I’ve always seen Christmas as more of a chore than a joyous holiday, filled with spending money, getting fat and not having a minute to breathe. I’ve always liked participating in Christmas parties but was never willing to do the hard work of planning myself. 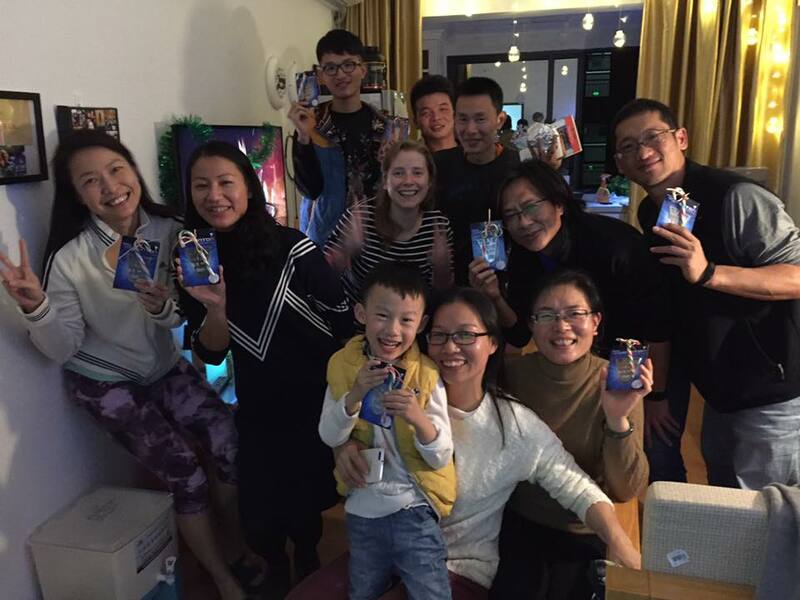 So when I moved to China I let Christmas take a back seat. Call me Mrs. Scrooge. But over the past few years I have started to play serious badminton and my coach and badminton friends have become like family. As the only foreigner I have begun to feel a bit of responsibility to introduce my Chinese friends to a bit of Western culture so they can understand me more. So last Christmas I decided to have a cookie decorating party. It took me awhile to gather all the necessary pieces (as even ovens are rare here, much less cookie dough, candy decorations and so on) and I wanted to do it up right. I downloaded a video of a roaring fire and added my own favorite Christmas music to play on my TV. I hung fake garland and strung lights. As I couldn’t find apple cider, I made my own and then mulled it. It was a cookie decorating party, but I knew we needed some snacks besides cookies so I got hummus and veggies, made some cheesey bread and had plenty of booze. Roaring fire on the TV, tiny (fake) Christmas tree in front of it, lights, garland, cookies, snacks and a ton of booze. I was ready. Basically it was a pretty rocking party. While I knew people would be surprised by cookies, some of the funniest remarks came at the least expected place: the veggies and dip. “It’s so funny to eat raw veggies,” said one friend holding up a carrot stick and looking at it. “I think its weird,” said another person chewing on a piece of celery. “Westerners really like this?” asked someone else and I assured them it wasn’t a joke and indeed we do. “I like it. I think it’s great!” said my coach scooping up the hummus trying to sound like the cool one of the group. 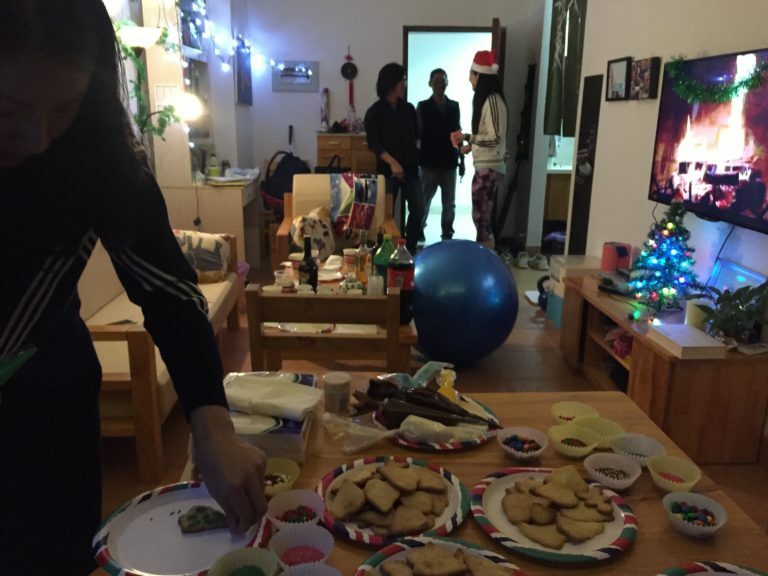 Despite never decorating cookies before, my friends did a very good job, though they thought the cookies were too sweet and didn’t eat many (it’s a common complaint from Chinese people that western desserts are too sweet). Normally people decorate with trees and holly, but ours had dragons, badminton shuttles and Chinese writing all over them. Afterward we kept drinking and played a competitive game of Pictionary (also a first for many people). Before everyone left I pulled out my stocking and gave them all a small gift tied with a candy cane around it (another imported good). They all oo’d and awww’ed the candy cane. As much as I tried to make it like an American Christmas cookie decorating party, it was obviously not at all traditional. No English was spoken, no Christmas stories were told, and the window was thrown wide open because it was a hot southern night, nothing at all like winter in New England. But one thing was the same: the camaraderie, the enjoyment of friends and the feeling of unity and love. You don’t need fancy imported goods or blood relatives to get that old Christmas feeling. You just need to find the right people wherever you are in the world. Guess I’m no longer Mrs. Scrooge. Aww I love this! I’m so glad you put forth the (incredible) effort to share your upbringing and traditions with your new friends and family, and that you had a rockin’ time! I could relate on a smaller scale. I grew up in Wisconsin with a lot of similar traditions as you described, but now live in Los Angeles with my Singaporean husband. Most of my colleagues are Chinese, and I’ve had a lot of fun over the years sharing my traditions with them as they share theirs with me.